Want to Stay Healthy This Winter? Consider Adding a Humidifier! Humidifiers are not exactly the most glamourous appliances in the world of indoor air quality equipment. In fact, they typically don’t even come up in casual conversation unless you are talking about a sick child or elderly loved one. But portable and central humidifiers can play an important role in keeping everyone in your family or your workplace comfortable and healthy during the chill, drying air of Ontario's winter season. This is particularly relevant since one of the chief triggers of the spread of seasonal cold and flu germs during the holidays is overly dry sinus and respiratory tissues, which can allow germs to gain a foothold because the body can't produce enough mucus to fight them off. 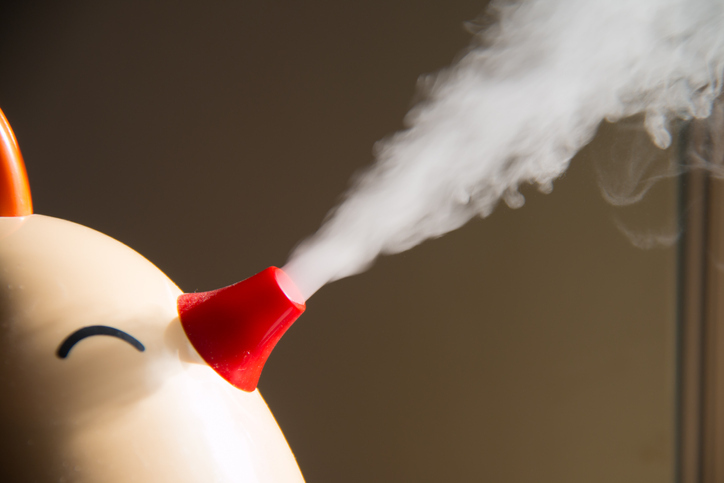 If you’ve vowed that you’ve spent your last year “enjoying” the winter holidays by honking into a tissue and chugging hot tea by the gallon, now is the time to embrace the healing powers of the humidifier. Read on to learn how! During the summer, when the outside air is hot and humid, we tend to turn to air conditioning for help keeping our indoor air comfortably cool and dry. But because we are also exposed to the humidity in our outdoor air on a daily basis, it is easier to keep our sinuses and respiratory passages sufficiently hydrated to stay healthier. In winter, when our air is dry outside and also quite dry from the heat indoors, it is a different story. As our tissues dry out more and more, we begin to experience health issues ranging from dry, cracked skin to dry eyes, nose bleeds, congestion, respiratory infection, colds, flu and worse. Even drinking warm beverages and taking medications doesn’t relieve our discomfort fully, since many of these traditional remedies are also drying. To restore moisture to our beleaguered bodies, we need humidity. This is where a humidifier can really come to our rescue! During the warm months of the year, the battle is typically aimed at keeping humidity levels from spiraling out of control. Spring and summer storms combined with warm temperatures can cause humidity levels to climb and create uncomfortably muggy conditions. Inside homes and workplaces, we battle mould and mildew growth while running our air conditioners to try to dry out our indoor air. But when the cold season returns, the tables turn and suddenly we have the exact opposite problem. All that heat dries our air out beyond what the season itself already brings. Now we are struggling to add moisture back to our indoor air to combat the discomfort of dry eyes, dry skin and dry tissues, sore throat, coughing and other symptoms. According to Health Canada, the optimal humidity range extends from 30 to 50 percent. During the summer, it is reasonable to aim to maintain 50 percent humidity. In winter, 30 percent humidity is more realistic. A hygrometer is a simple, affordable and useful tool to measure and monitor your indoor humidity levels year-round. There are two main types of humidifiers. Portable humidifiers are designed to add moisture to the ambient air in a smaller, enclosed space such as a room or small apartment. Whole home or central humidifiers are designed to work with any ducted temperature control system to add moisture back into the air as it moves through a whole home or office space. A portable humidifier may be the right solution for you if someone in your family is struggling with chronic respiratory issues, allergies or asthma. The same holds true if you are uncomfortable at work due to an overly dry workspace. For larger spaces outfitted with a ducted air conduit system, a central humidifier can help to monitor and maintain ambient air humidity throughout your home or work space for everyone’s health and comfort. If you plan to use a central (whole home) humidifier, you have options for how and how often you want your humidifier to run. A whole home flow-through humidifier works directly with your furnace to generate and distribute moist air to each room in your space. Without getting too complicated as to how they operate, these humidifiers send air through a humidifying pad and then out through the air ducts. A whole home steam humidifier generates moisture and pushes it out into your air duct system to be conveyed along with the warm air from your furnace into each room of your space. As you might imagine, there are pros and cons to each type of system. Steam humidifiers are generally regarded as the most efficient type of whole-space humidifiers and require the least amount of annual maintenance. Steam humidifiers can operate whether the furnace is running or not and tend to be a very reliable type of humidifier. Flow-through humidifiers will use less water than steam humidifiers and don’t need a lot of maintenance to keep working. These humidifiers will operate only when the furnace is also running. Both types of humidification systems can be good options to keep a healthier level of moisture in the air at home and work. Is someone in your family or at work struggling with allergies, asthma or seasonal cold and flu symptoms? A humidifier might be the perfect solution to ease discomfort and improve health this fall and winter! Contact us online or give us a call at 905-544-2470 to learn more about how adding humidity to your indoor air can ease winter health issues and help you enjoy the holiday season this year and in years to come!